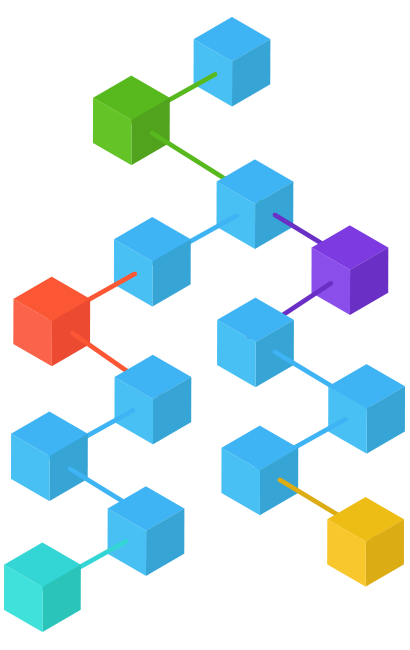 Adapting the concept of Blockchain as a service (BaaS) model to provide industry specific business solutions. Leveraging Blockchain development services like smart contracts, cryptocurrency wallet and many more to transform businesses. Blockchain technology has proven to be the most secure way to perform business transactions all over the world. The reason for the fast increasing demand of Blockchain technology is its ability to eradicate any possibility of human as well machine errors while transactions. Due to the immense success of Blockchain technology in the banking industry, other industries like real estate, information services, fund administration, legal, online shopping portals and many more have started adopting Blockchain solutions in a successful manner. We at Virtueinfo understand the ever increasing demand of the technology and hence provide high quality Blockchain development services to large scale businesses all over the globe. Virtueinfo already has a proven success record for providing quality web and mobile development services for more than a decade. And because of our immense IT experience we have developed an expertise in providing Blockchain development services to businesses from all the industries. The reason that we are considered a top Blockchain development company is our guarantee to provide Blockchain applications that simplifies business processes making them transparent, quick to use and secure. Our dedicated Blockchain developers are our true assets as they have successfully completed Blockchain development projects for large and small scale businesses. What makes our developers stand out is that they have achieved excellence in integrating multi-cryptocurrency as a payment option for various web and mobile devices. Smart contracts are a replacement of traditional contracts as they are self executing in nature. Smart contracts can establish when a contract has been fulfilled by validating conditions of a contract between two or more parties. Cryptocurrency Wallet is required to store, send or receive cryptocurrencies. It is a software that can be used on desktop, mobile or online. Virtueinfo will develop customize cryptocurrency wallets as per the client's requirements. Ethereum is an open-source, public, distributed computing platform based on blockchain technology. It eases the development of Smart Contracts and Distributed Applications. It is an open source distributed ledger that is based on Blockchain technology and uses smart contracts. Our developers have in-depth knowledge and expertise in Hyperledger technology. Multichain is an open source blog chain platform that helps businesses to build and deploy blockchain applications with speed. We can help you in reducing your administrative cost and improve your traceability with our effective supply chain solution. Virtueinfo can help you build safe, secure and user friendly cryptocurrency exchange development solutions for buying, selling or exchanging multiple cryptocurrencies. After completing many blockchain projects successfully, our dedicated blockchain developers have become proficient in understanding your each and every requirement and will provide you the best output that would be more than satisfying. Our team consists of developers with more than 13 years of experience in the IT industry. Hence they have deep understanding in developing applications that is user friendly and without any errors. The main reason of our tremendous success over all these years is our ability to develop highly secure applications that are impossible to hack. We at Virtueinfo has adopted an Agile software development process to deliver projects. The benefits of following agile methodology is that high quality output is delivered with minimum risks and within the predicted time frame. We have a record of completing all our projects within the given time. We take our commitments with clients very seriously and go to extreme measures to deliver a project in a decided time frame.